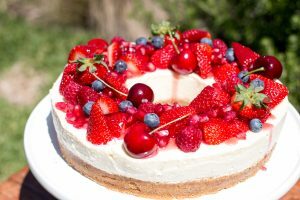 This cheesecake is absolutely delicious with Christmas Spices in the base, a deliciously light Cottage Cheese and white chocolate Filling and topped with wonderful Red Berries. An edible Christmas Wreath wow!!! How to make A Berry Christmas Cheesecake. An assortment of red berries (Strawberries, Raspberries, Cherries,Pomegranate,Blueberries). Place the biscuits into a food processor and just pulse them quickly to turn them into crumbs. Add the cinnamon, ginger and cloves into the biscuits crumbs. Pulse quickly. Pour in the melted butter and turn the processor on one last time to mix through thoroughly. Pour the biscuit mixture into the prepared cake tin. To prepare the cake tin make a circle of waxed paper to fit the bottom of the tin and place a straight sided glass into the centre. Press and flatten the crumbs so they are evenly filling the bottom of the tin. I use the end of a rolling pin to do this, try not to knock the glass in the centre. Now place the base into the fridge to chill. 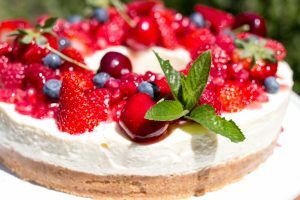 To make the cheesecake filling, place the cottage cheese, sour cream, sugar, the lime zest and juice into the food processor and mix until everything is combined. Melt the chocolate in the microwave. Dissolve the gelatine in a little boiled water that has cooled a little. Pour in the melted chocolate and the gelatine and mix through one more time. Remove the base from the fridge and pour the cheesecake mixture over the crumb base. Place into the fridge for an hour or two to set. To remove the glass from the centre of the set cheesecake, pour a little hot water from the tap into the glass and gently twist to release the glass. Pull out carefully. Release the clip of the spring form tin and gently remove from the cheesecake. Place the cheesecake onto a serving plate and decorate with the red berries. Drizzle with Raspberry Coulis and serve.